I have only another 20-30 minutes or so until I turn the final page of “H is for Hawk”, the acclaimed prize-winning memoir by Helen Macdonald. And that thought makes me feel the way I do in the waning hours of a most rare soul-nourishing, mind-cleansing vacation. And it is not because Macdonald writes in detail about her interesting and unusual avocation of falconry and in particular, takes us on a journey as she acquires, trains and bonds with a goshawk, a fierce hunter of the forest floor. And it is not because she has such facility with words, making her prose so pleasurable to read it almost hurts. Rather, “H is for Hawk” is so gripping and difficult to let go because in it the author shares the painful journey of healing from the depths of despair and loss after the unexpected death of her father. Macdonald is certainly not the first to counterpose her personal grief and loss against the backdrop of raw nature. Cheryl Strayed wrote her memoir “Wild” about her attempt to heal her battered soul while she through-hiked the Pacific Crest Trail and that story was memorialized last year in a Hollywood movie. But while Strayed’s story was 2-dimensional, her angst and the trail, Macdonald’s writing takes the reader into four dimensions: the very painful loss of her father, the story of her experiences with her goshawk, the odd, sad and compelling story of author T.H. White (known for the children’s classics “The Sword In the Stone” and “The Once and Future King”) as detailed in his work “The Goshawk”, and the fourth dimension, time, as she takes the reader into the rich history of falconry through the ages. Ms. Macdonald, a historian by education as well as a writer and poet, chronicles her experiences rearing and training a goshawk to hunt rabbits and pheasants, spending day after day with the bird, feeding it, weighing it, bonding with it and almost becoming it. The goshawk, affectionately dubbed Mabel, is not the first raptor that the author has trained. Fascinated by birds of prey since childhood, and with extensive experience working with and flying them, the author now decides in the wake of her father’s death to train one of the most challenging birds flown by falconers. Goshawks have a reputation for being difficult to work with and their hunting style is different from other hawks as well; they fly low to the ground, preferring to hunt in the forest as opposed to the open field. That challenge is what she needs while she is in mourning. Macdonald’s truths are difficult to hear for romantics like myself who have indeed looked to the woods as an escape. But ironically I have of late come to the same conclusion. It would be nice if the deep forest truly cared about us and could offer a consoling embrace, but a towering oak tree casting a cool shade under its leafy canopy on a steaming hot day would just as soon fall upon and crush me than shade me. Nature is implacable, reflecting back only what we bring into it, if that. 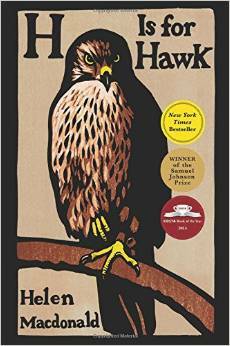 “H is for Hawk” tells a story we each are likely to confront at some point in our lives if we have not already. Without the hawk, though, leaving us to find comfort and solace and healing among our own species. A discovery and a story that Madonald tells so so well.